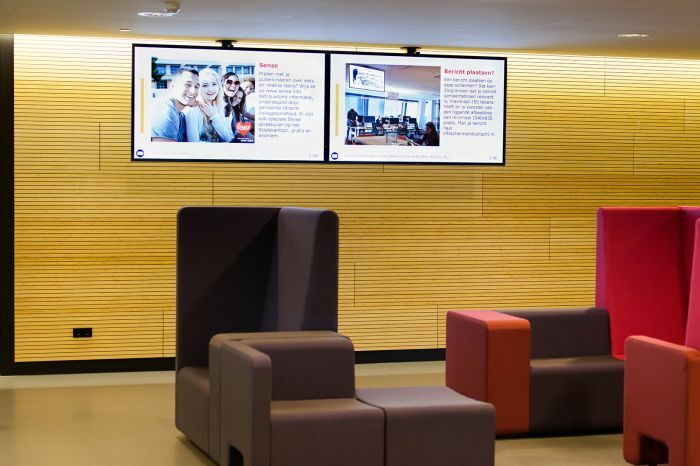 Utrecht City Council in the Netherlands has installed 34 BrightSign digital signage players to drive a state of the art digital signage installation in its new, purpose-designed building in the centre of the city. The chosen solution is helping the council improve customer service and ensure the best possible working environment for staff. City councils throughout Europe are seeking to deliver better experiences for people who engage with the organization, whether these are working partners or members of the public, who may be customers of the council's services or simply seeking information services. Councils also face the challenge of communicating with large numbers of staff - sometimes several thousand -who may be working at various different locations in the city. Communicating effectively with staff wherever they are, by delivering timely and consistent information, is vital to maintaining a high quality of service and efficiency, and also to help keep staff content and motivated. rooms, as well as a spacious public lobby and atrium. Commissioning the new building provided the ideal opportunity to take a new approach to communicating with both visitors and staff, using the latest technology to upgrade the customer experience and standardize methods of communicating with staff. Before the new building was opened, a large proportion of the council's employees were located across 13 different buildings around the city. Various communications techniques were used to inform people of relevant changes and decisions, including email, intranet, and letters or posters on noticeboards in corridors or elevators. After conducting research, the council decided that digital signage could offer a more efficient, more standardized means of communicating, which would also offer greater ease of use and reach the whole organization more effectively. As a next step, the council engaged a consulting agency specialized in audiovisual media to develop a specification for a system meeting their needs, and ultimately issued a tender. At the conclusion, the council chose the proposal from Utrecht-based Hulskamp Audio Visual, which comprised 34 large-size LCD screens, with BrightSign digital media players and software supplied by VMS, BrightSign's Amsterdam based distributor. Erik-Jan de Dreu, Sales Manager at Hulskamp Audio Visual takes up the story. "BrightSign's equipment was the best fit for this project, and enabled us to deliver the most attractive solution for the council in terms of functionality, quality, price and ease of use." The proposal was based on 34 BrightSign XD1030 networked digital signage players and BrightAuthor content creation/management software. This solution provided Utrecht with the advanced functionality they needed, but is also very easy and intuitive to set up and use. Three players support Full HD MPEG-1/2 and H.264 video, and support HTML5 content. Support for live feeds such as RSS, Twitter and Flickr is built in. Hulskamp implemented content management using the free BrightAuthor software shipped with the players, which provides intuitive tools to help Utrecht staff get the best from their BrightSign signage. Hulskamp also made use of the BrightSign Network cloud-based service and BrightSign Network Enterprise Edition, which provides all the functions needed to manage networked media players and content across a private network protected by a firewall. In the new Utrecht City Council headquarters, 23 BrightSign XD1030 media players now provide information for staff via large 46-inch displays in prominent positions on each level. "Our new signage has provided immediate benefits by presenting practical tips about the new building, such as where to go and how various systems operate," comments Maaike Wilmink, Facilities Project Leader at Utrecht City Council. "This has helped everyone to settle in quickly. We can also keep staff informed on a variety of subjects, from giving answers to frequently asked questions, to letting them know what's on the menu in the canteen." In addition, six further XD1030 players are connected to 70-inch displays located in individual departmental reception areas on various floors. These are proving highly effective directing visitors where to services, and letting them know the likely waiting times. The public atrium area has another two 80-inch screens connected to XD1030 players, which are dedicated to providing public information and promoting events in the city. A further three 32-inch screens in the public area, controlled by BrightSign HD1020 players, provide tourist information for visitors, such as traffic advice and train timetables. Alongside digital content created by the council, the system also integrates RSS feeds presenting information such as national/international news and weather. "This was the first time we used BrightSign players, and we greatly appreciated the pro-active technical support from their distributor in Benelux, VHS. The entire project, from the beginning of system installation to completion, took only four months," explains Hulskamp's Erik-Jan de Dreu. "We have also provided training for the council's communication staff, to help them manage content independently and utilize the features of BrightAuthor for creating the content and BrightSign Network Enterprise Edition for managing the network." VHS supported Hulskamp in installing the system, and configuring the BrightSign Network. As soon as the system was live, the council began to appreciate the positive effects on customer service, as well as the information available for staff to help improve performance and quickly become familiar with their new surroundings. "Our experiences within the first couple of months vindicated our decision to install digital signage, and confirmed the value of the BrightSign solution in such a large people-focused organization," agrees Maaike Wilmink. "We are now moving forward to establish a structure comprising departmental editors who will take ownership of the content and make sure it is focused and relevant to their own departments," she continues. "The equipment is very easy to use, and with the training we have received from Hulskamp, we are confident of succeeding.". to help improve performance and quickly become familiar with their new surroundings.